Quite a few people have asked me how I cut and smooth gear and clock wheel teeth. In this video I cover the how and why from start to finish. 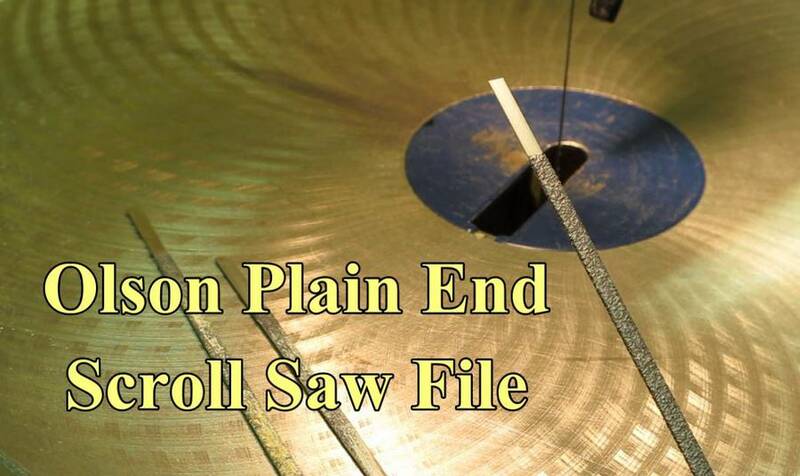 Scroll saw blade used, blade tension, blade breakage, safety, how to cut the pattern, sanding/filing and the particular scroll saw filing strips I use, are all covered. This is how I have cut and smoothed all my gears... planetary gear drive, clock wheels, pin gear ring gear (in part), clock winder and the marble machine. These blades are relatively thin and have performed well for me in Baltic Birch plywood and hardwood 1/4" to 3/4" thickness. 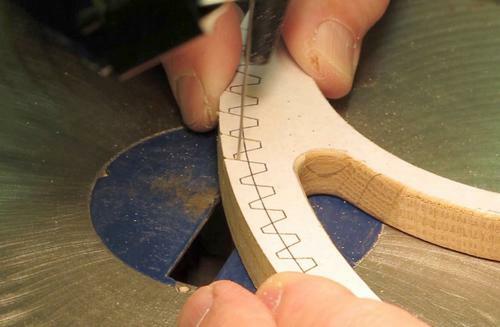 Correct blade tension is obtained by plucking the blade like a guitar string and listening for the correct sound. Practice (trial and error) will result in the correct tension for each particular blade and for the material you are cutting. I usually make all of the cuts on one side of the teeth, all the way around the gear. This makes them repetitive cuts and allows you to get into somewhat of a rhythm. Take your time and let the blade teeth do the cutting. Forcing the wood into the blade will distort the blade and overheat it, leading to premature failure. When you notice the blade changing color (turning blue) or when it isn't cutting as well as it was a while ago, change the blade. It is always best to change a blade before it breaks. I cut right up to the pattern line with the saw blade. 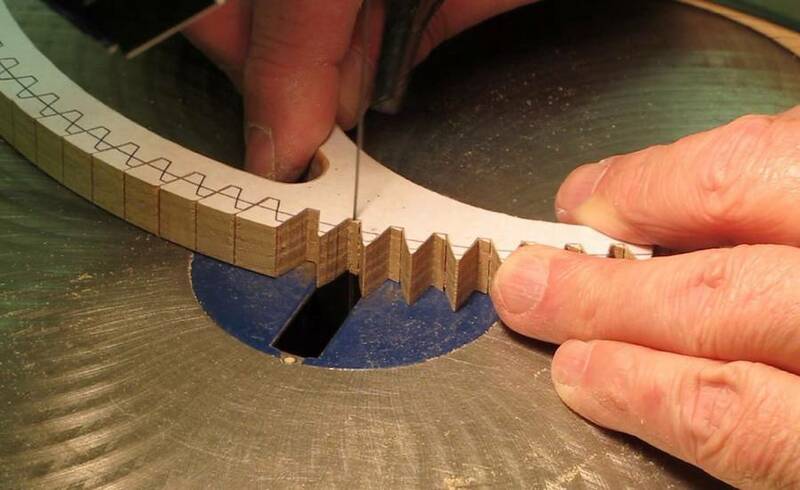 After considerable practice you should be able to split the line with the saw blade. Wood type, thickness, grain direction and other variables will influence the direction of the cut. Always try to err on the waste side of the pattern. You can always true it up later with the side of the saw blade or with the files. Always expect the blade to break. 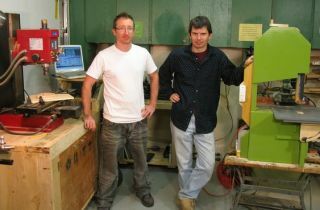 When a blade breaks it can grab onto the wood slamming it up and down on the saw table, which may break the workpiece. Always hold the workpiece firmly and maintain downward pressure. Keep your fingers as far away from the blade as possible and anticipate the blade may break at any time, even when not cutting. Next I make a cut on the opposite side of the teeth and cut out the root of the tooth. Then I cut the base of the tooth and finally I use the side of the saw blade like a file to remove any rough areas and to clean up the base of the tooth. I always leave the blank slightly larger in diameter than the finished wheel or gear. This extra material gives you a place to start your cut and zero-in on the tooth pattern line. It also helps prevent chips on the corners of the teeth. After all teeth are cut, I sand to the pattern outside diameter on my Circle Sanding Jig on the Disc Sander. Please see my video on using this jig. 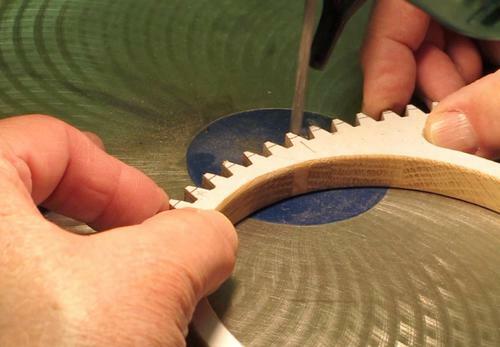 The scroll saw blade produces an amazingly smooth surface, however there may remain some unevenness or saw marks. 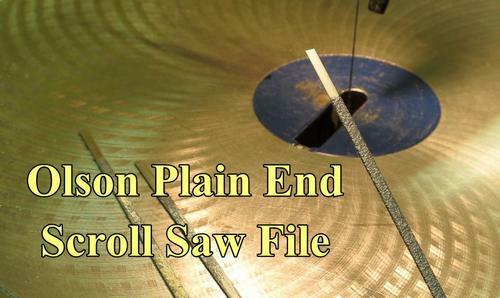 The scroll saw files are strips of metal with an abrasive epoxied to the surface. I use the files to polish the tooth surface and remove any imperfections and saw marks. 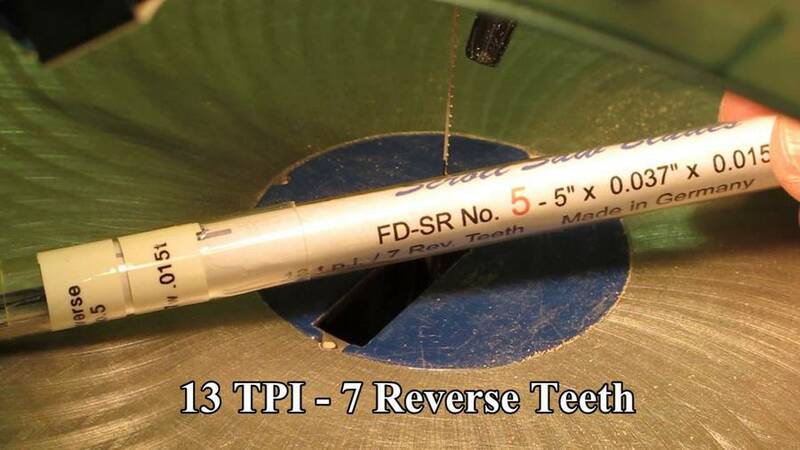 By the time the tooth surface looks good, the remainder of the pattern line should be gone. You can rotate the files and flip them end for end to take advantage of all cutting surfaces. I tend to use them down to the very end. Excessive pressure on the surface of the file will cause wear and can heat up the epoxy causing it to fail prematurely. Slow and easy, let the abrasive do the work. Keep the file moving constantly back and forth and avoid touching the base of the tooth with the edge of the file, as it will leave grooves in the base. Polish both tooth faces first and then clean up the base of the tooth form using the edge of the file. Practice... practice... practice intertwined with patience... patience... patience. Now I know why Ron's gears always come out so nice -- very different from my approach of cutting them as fast as possible. 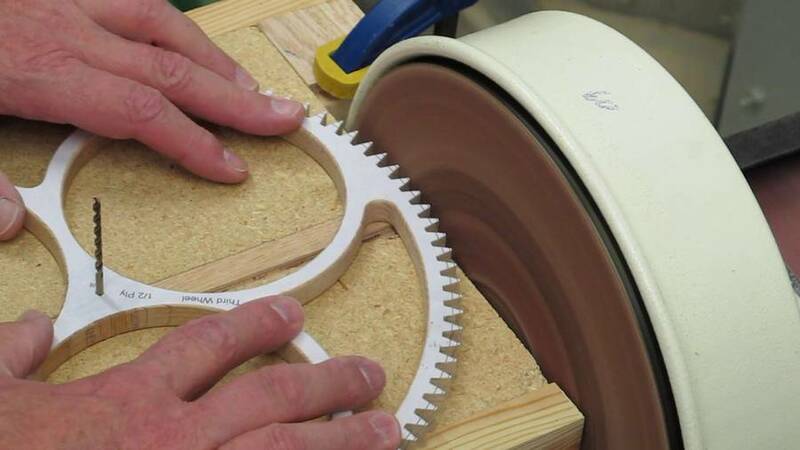 The particular wheels in this video are for the Solaris clock. They are the largest I have made at 12" to 14" diameter with 100 to 120 teeth each. I have considerable time invested just in the segmented blanks before starting to cut out the teeth. You don’t want to be tired or distracted while cutting the teeth. If my back isn’t bothering me too much I would expect to cut the teeth out for one wheel in a day, spread out over 2 or 3 episodes. Or, I may spread it out over two days. The filing would probably take another day. I use a large magnifying glass with a work light to have a good view of the saw blade and pattern. 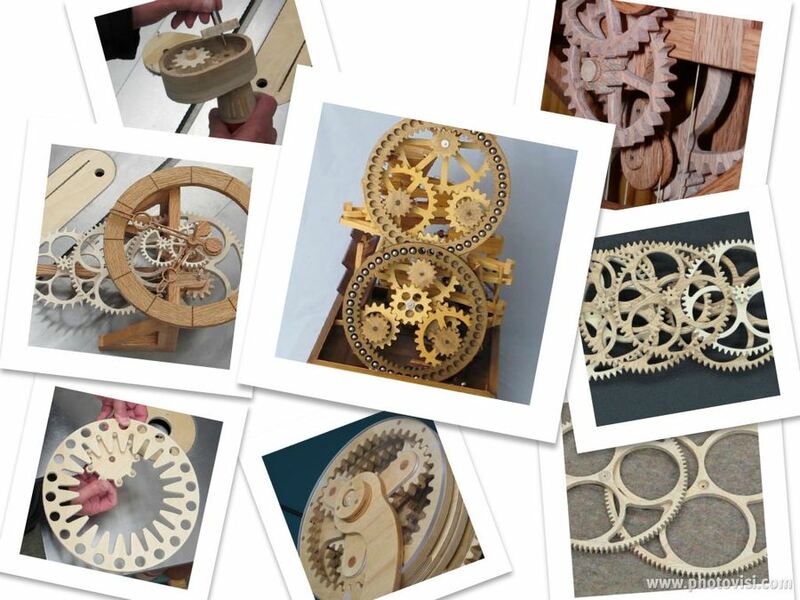 A mechanical gear doesn’t always need to be so smooth but a clock wheel really needs to be a perfect as you can make it.